Following up on our recent accounts of how Pekin became an incorporated town in 1837 and an incorporated city in 1849, this week we’ll scan a wider vista as we study the incorporated municipalities of Illinois. The city of Pekin is just one of 1,299 Illinois incorporated municipalities, of which there are three kinds: villages, towns, and cities. Given the usual definitions of those terms, one might assume that the kind of municipality depends on population and geographical size – villages being little, towns being mid-sized, cities being largest. But size has almost nothing to do with it. For example, Melrose Park near Chicago is a village, but has a population of about 25,000, while the southern Illinois municipality of Nason in Jefferson County is a city, but has only 236 residents, making it the smallest city in Illinois. Meanwhile, both Topeka in Mason County, population 71, and Normal in McLean County, population 54,264, are towns. The largest town in Illinois is Cicero, population 82,992, and the smallest town is Bentley in Hancock County, population 34. The kind of municipality isn’t a matter of size. Rather, they are three forms of municipal government. The main difference is that villages and towns are governed by boards of trustees, while cities are governed by mayors and city councils. The city form of government may be aldermanic, commission, or mayor/managerial. 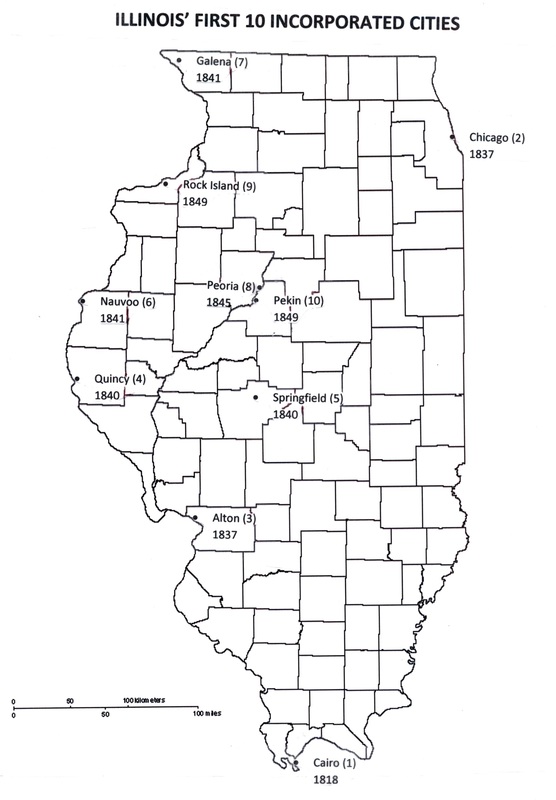 Remarkably, there are only three counties in Illinois that have no cities: Calhoun County, which has only five villages, all incorporated in the 1880s and 1890s; Henderson County, which has only eight villages; and Putnam County, which has only six villages. But Tazewell County has five cities: Pekin, incorporated Aug. 21, 1849; Washington, first incorporated Feb. 10, 1857; East Peoria (formerly called Hilton), first incorporated July 1, 1884; Delavan, first incorporated April 17, 1888, and the youngest of our county’s cities, Marquette Heights, incorporated June 27, 1956. As noted previously, the 1870 Illinois constitution eliminated the option of “town” as a possible choice when a settlement opts for incorporation, so afterwards there could be no new towns. Many Illinois municipalities started out as villages or towns, later adopting a city form of government, but many have remained villages and a few – only 19 – have decided to stick with their original town charters. Most municipalities (including Pekin) re-incorporated under the 1872 general law of incorporation. Under current incorporation law, a locale must have at least 200 people to incorporate as a village and at least 2,500 to incorporate as a city. Even if the population later shrinks, the municipality need not give up its form of government, but the choice to unincorporate is sometimes made when a municipality declines. Most of our municipalities were established after Illinois became a state in 1818, but a few settlements were incorporated when Illinois was a territory – and Illinois’ earliest incorporated settlement was Kaskaskia, the former territorial capital and first state capital, which received its original town charter from King Louis XV of France in 1725 during the colonial period. Almost a year before Illinois statehood, Kaskaskia was incorporated as a town on Jan. 6, 1818. The following year the state capital was moved to Vandalia, and poor abandoned Kaskaskia eventually was almost completely destroyed by a flood in April 1881, when the Mississippi River changed its course. The 2000 federal census showed only nine people left in the bayou that is all that remains of the first state capital. Another Illinois city, Golconda in Pope County, was already around by 1816 when Pope County was established. Originally called Sarahsville, the residents opted for the name “Golconda” on Jan. 24, 1817, and they received a town charter on March 1, 1845, becoming a city some time later. Thus, one must not interpret the date of incorporation as the same as the date of founding, because usually a community or settlement existed for several years, even a long time, before finally incorporating. Of those municipalities that later became cities, Pekin was the 17th municipality to be incorporated since Illinois became a territory — but the earliest one of them to become an incorporated municipality was Shawneetown in Gallatin County, which became a village on Dec. 8, 1814, a town on Feb. 27, 1847, and a city on Feb. 22, 1861. Old Pekin historical publications say Pekin was the 10th incorporated city in Illinois, a claim that can be confirmed by consulting Illinois state records and old published county histories. The very first incorporated city in Illinois was Cairo in Alexander County, which was granted a city charter on Jan. 9, 1818. In those days, however, Cairo was really only a city on paper. The site was chosen for a city because, as the charter states, the confluence of the Ohio and Mississippi rivers was thought an economically auspicious location. In those days, there seemed little grounds to hope for prosperity in a city on the shores of Lake Michigan (the railroad was still a new invention, and the St. Lawrence Seaway was yet future), and Illinois depended on the Mississippi for the movement of people and goods. Nevertheless, no one would be interested in living in the planned and platted city of Cairo for many more years to come. A new settlement at the site was founded in the 1830s, and so Cairo was given a second city charter on March 4, 1837. Shown is a detail from an 1819 Illinois state law that lists several pre-statehood laws that had been passed by the Illinois Territorial Legislature. One of them, approved Jan. 9, 1818, was “an act to incorporate the city and bank of Cairo” — thus making Cairo at the southern tip of Illinois, then only a proposed city, the first incorporated city in Illinois. If not for Cairo’s 1818 charter, the honor of being Illinois’ first incorporated city would go to (where else?) Chicago, which became a city on March 4, 1837, the same date as Cairo’s second charter. Chicago was originally incorporated as a town on Aug. 12, 1833. Coming in close behind Chicago as Illinois’ third city is Alton in Madison County, which incorporated as a city on July 31, 1837 (but became a town before Chicago did, on Jan. 30, 1821). The fourth and fifth cities of Illinois were Quincy and Springfield, but were incorporated by the Illinois General Assembly on the same day, Feb. 3, 1840. Springfield, which incorporated as a town on April 2, 1832, had recently been designated as Illinois’ third state capital. It officially received its city charter on April 6, 1840. Illinois’ sixth incorporated city was Nauvoo in Hancock County, which served as the headquarters of the Church of Jesus Christ of Latter Day Saints (the Mormons) until the Mormon War. Nauvoo became a city on Feb. 1, 1841. After the fireworks of Galena’s city charter battle, Peoria much more quietly became the eighth incorporated city in Illinois on April 21, 1845. Almost four years elapsed until Illinois got its ninth city: Rock Island, incorporated on Feb. 12, 1849. Six months later, in August of 1849, Pekin voted to adopt a city charter, making Pekin the 10th incorporated city in Illinois.